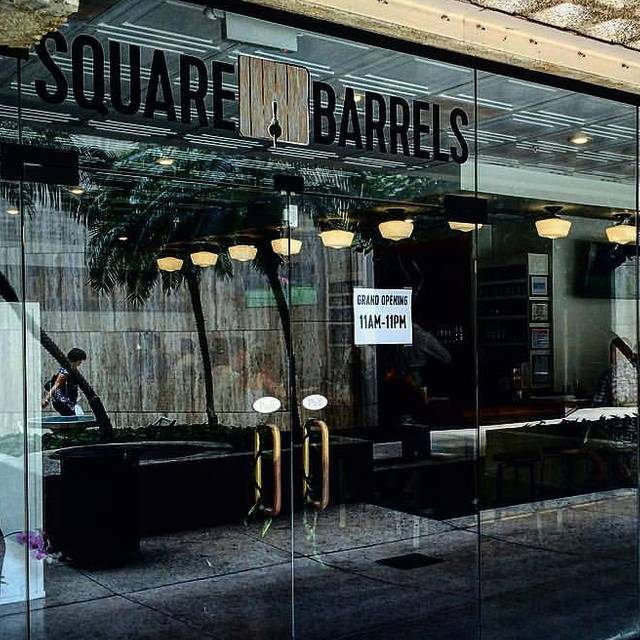 You must make reservations at least 5 minutes in advance of the time at Square Barrels. The bar stays open at least 1 hour more than the hours above. Parking is available in the Bishop Square Parking Garage (entrance is on Alakea Street). It is just $2 with validation. There is a 2hr parking limit during the day before 5:00pm M-F. No limit afterwards, and all day Saturday. To get to Square Barrels after parking, take the elevator to the ground floor. Walk to your right when entering the mall level. We are right after you pass Cookie Corner. See you soon! Most buses that go through Downtown Honolulu will stop in front of us. We are in the courtyard of Bishop Square right by the Hotel and Alakea bus stops. 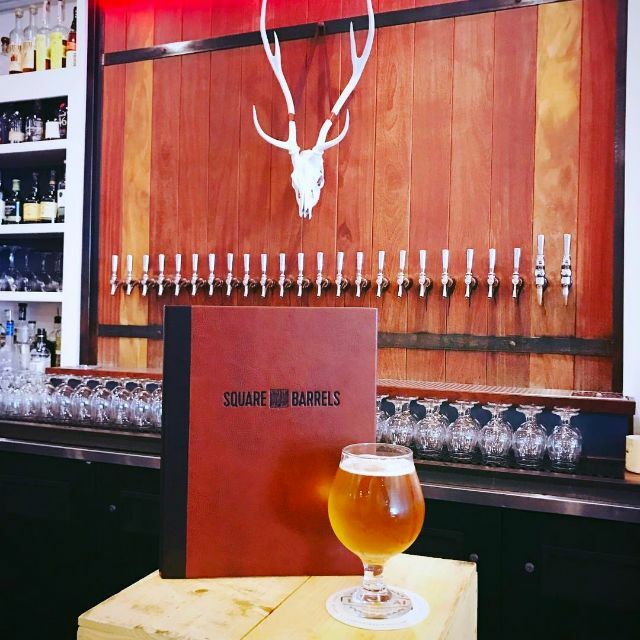 Welcome to Square Barrels, a craft burger and craft beer restaurant in Downtown Honolulu that specializes in serving a refined take on a beloved culinary classic. 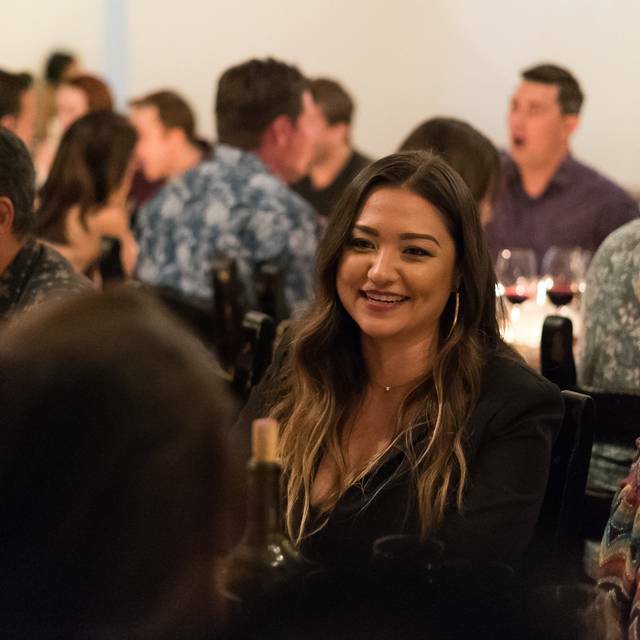 With a kitchen creating and caring about every little piece of the culinary experience, you can rest assured that we are using the best ingredients in every step. 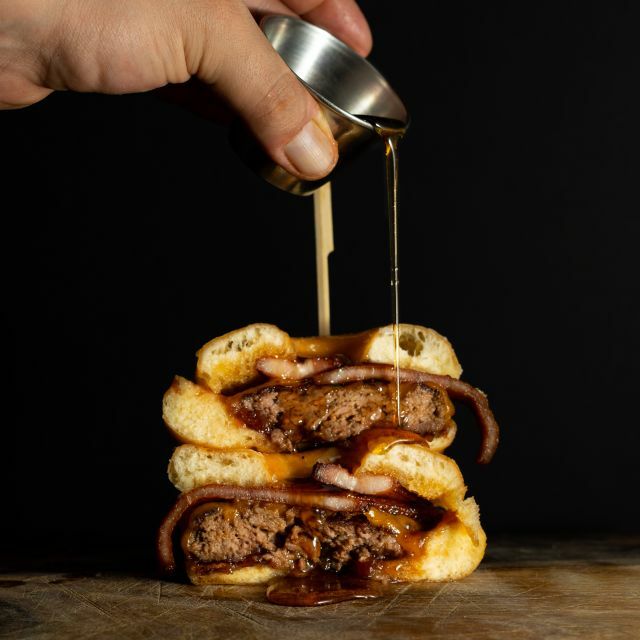 Square Barrels is more than a burger and beer “joint”. It’s the ultimate food-pairing trip back in time. 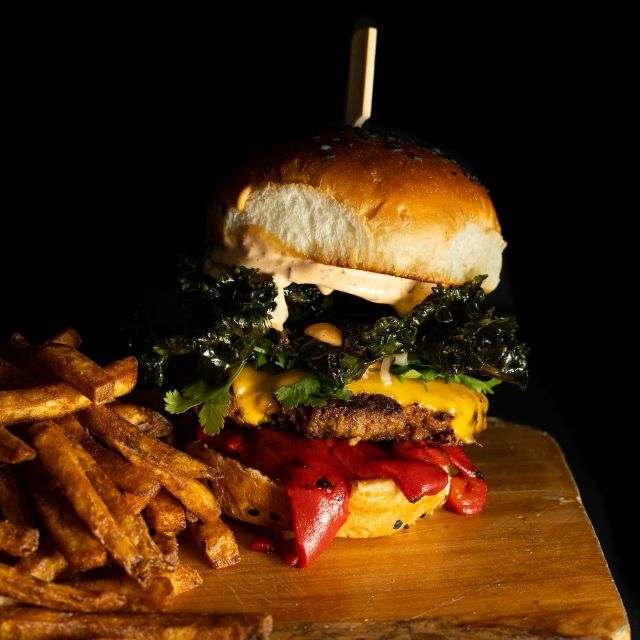 Nostalgic house specialties made-to-order straight from the grill include the Square Barrels signature Drive-Thru Burger (made with fresh house-ground 80/20 local beef) and the delectable Venison Burger (made with fresh house-ground Maui venison). Then, wash it down with one of our over 20 craft beers on tap including the latest brewery selections from Hawaii, California, Oregon and around the world. I selected the noise level option as moderate because the restaurant itself is very noisy. Energetic is not reflective of the atmosphere. We had reservations but was seated in the bar area on bar stools. I guess the place was packed due to a trivia game. We ordered our food and drinks. Our drinks came promptly but we waited and waited and waited and waited for our food. We finally cancelled the food at 6:30 because we were going to a 7:00 show and at that point was told our food was up next to prepare. We had been waiting at least 45 minutes. Our server was very apologetic and we know it wasn't his fault. Poor planning on management. Excellent beer menu, and great bar service. Charcuterie was amazing, as was the salad. However, the truffle burger was definitely not up to par with what I expected for the price. Minimal toppings and sauce, and not as flavorful as expected. The burger was also not very juicy, which when ordering medium rare, I would expect. I plan on going back and ordering a different burger. Tasty food, great beer. Worth the money and drive! 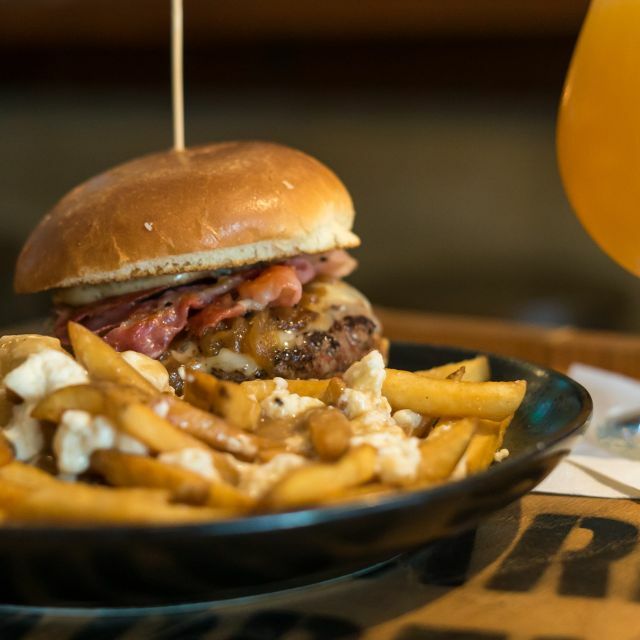 Great burgers and excellent beer selection. 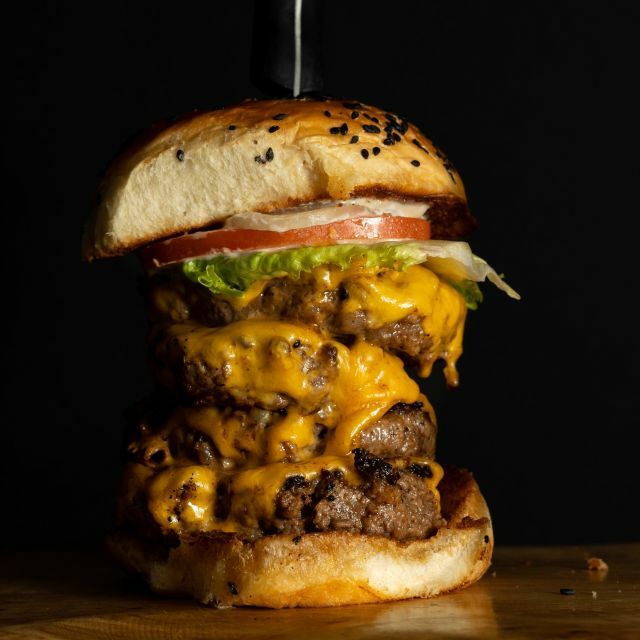 Non menu burger! So just add it already. Drinks well made and the decor was modern but not standard... Clean white pallet and warm wood tones. Drive-thru burger is delicious. Decadent fries. However, lacks ambience and the drinks are subpar for their price. Great food!! 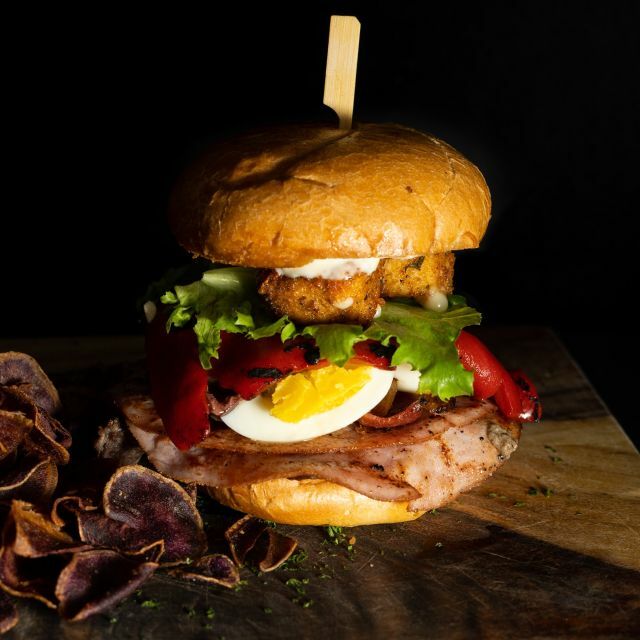 This is now my go-to spot for gourmet comfort food; the burgers are amazing! The noise level is a bit loud though. Great food & service! When we arrived, we went right in to our table & our waiter was gracious, informative & service was quick. Mahalo! The food was delicious and the service was great. The selection of local craft beers was amazing. I thought the food was ok. I ordered a medium rare burger it came out well done. I was very displeased with that. It was confusing to get a table even though we made a reservation. I think comedy night caused some problems. The server was good I just think our food sat in the window too long. The burgers we're creative and original but flavors were off a bit. The pricing is a bit higher than you would expect for a burger and beer joint too. 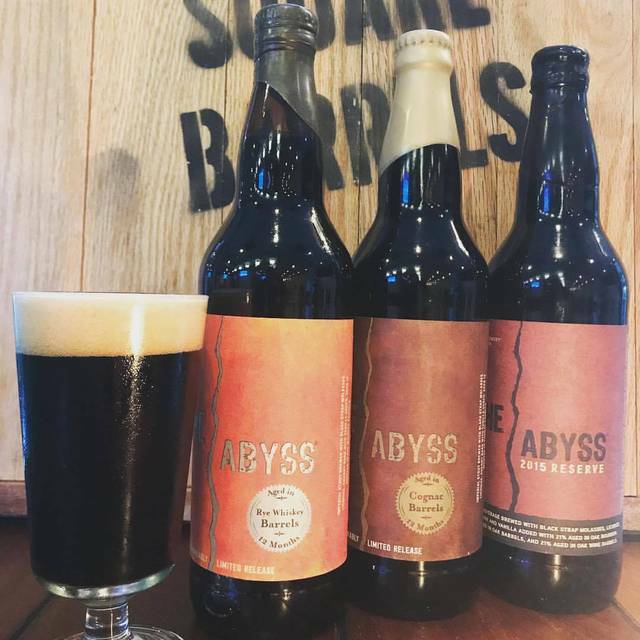 But.....Square Barrels is so much more than a burger and beer joint. The beer list is insane! Tons of brews I've never heard of and flight options to try whatever you'd like. Our server was excellent, he knew the menu 100% and checked in us exactly the right number of times. Comedy nights every Thursday, stay for the whole show! Very noisy, but fun , great waiter. challenging access. The food was very good & our waiter was very helpful. He suggested our dessert, which was excellent. We will be back! Great service, good beer, and nice little place. Food was ok, a bit high priced for what you get though. The drinks were just ok. Im not a beer drinker so I expect a lil more band for my buck and it wasnt there. 100% awesome (again) for my business lunches there. Noel makes the customer experience fun. The burgers are phenomenal. I enjoyed the food and outstanding customer service. The burger I got was about 2 1/2 inches across. It was over cooked and had a poor taste. It was so loud I couldn’t hear my family. Super expensive though I don’t mind paying for good food, but it was terrible for the value. Great gathering spot after work! Good experience so far great burgers but a little pricey. We went to have lunch and enjoyed the food. The noise level was a little loud so hard to hold a conversation without speaking up. Will definitely visit this establishment again. I also love the fact that you can make a lunch reservation downtown. The food, service and drink selection is great. What a friendly and fun experience. Thank you for your review! Please come back and visit us soon. Love the high energy, fun, positive attitude, excellent service. Food was amazing...so was venue and comedy show. I feel they need a bigger wait staff on event nights. Kept having to flag our server down. Twice I even had to get up and find him. And their chocolate souffle was a hard cake in a ramekin. It was cold and like a rock...we sent it back and it came back worse. Great staff, everyone was so friendly. My burger was delicious, beer was great as well. Everyone in our group had a wonderful time. Our server was great very attentive. service was slow for our section. good food, decent selection of beer. Due to noise level, sometimes difficult to hear conversation. Definitely, not a place to conduct a "business" lunch. The food was good and service could of been better. She didn't even give us refill on our tea. We had to ask for straws for our drinks too. Thank you for your review! We are an ocean friendly restaurant and that's why we do not offer straws, unless requested and we only use metal straws. We try to take every avenue possible to minimize any negative impact that we may have on the environment. We also use all biodegradable carry out items and do not use plastic bags. Apologies that you were not given a refill on your tea, but we do hope you will give us another try, since we try to maintain high quality customer service at all times. Great place for a small lunch meeting. Great fresh food choices. We came in to grab a bite before heading off to a concert. Unfortunately for us, there was a large party that took up most of our server's time. Our reservation time gave us plenty of time to get to the show, but with the lack of service, we really took it down to the wire. We had to ask other employees where our server was, what the status of our order was--it took 20 minutes to get a beer.